The Leopold pack was one of the first new packs to form after re-introduction efforts in Yellowstone. Two translocated wolves from different packs (002M from the the Crystal Creek pack and 007F from the Rose Creek pack) produced 3 pups together in 2006 and established their territory in the Blacktail Plateau area. This prolific alpha pair successfully reared pups each year from 1996 – 2001. By observing this pack beginning at its inception, biologists were able to gain insight regarding pack structure and dynamics. For example, many pups born into this pack remained as pack members for multiple years, creating a complex age structure consisting of a breeding pair and their offspring of multiple ages. In 2002, the alpha female (007F) was killed by other wolves and the alpha male (002M) subsequently dispersed from the pack and was later killed by other wolves as well. An unknown gray male (later collared as 534M) joined the pack as the new alpha and paired up with 259F who was born into the Leopold pack. Pack stability wavered in 2003 when the new alpha female (259F) died of unknown natural causes and her sister (209F) gained alpha status and successfully reared pups during the same year. After three pack females denned in 2005, there were 25 wolves in the Leopold pack. 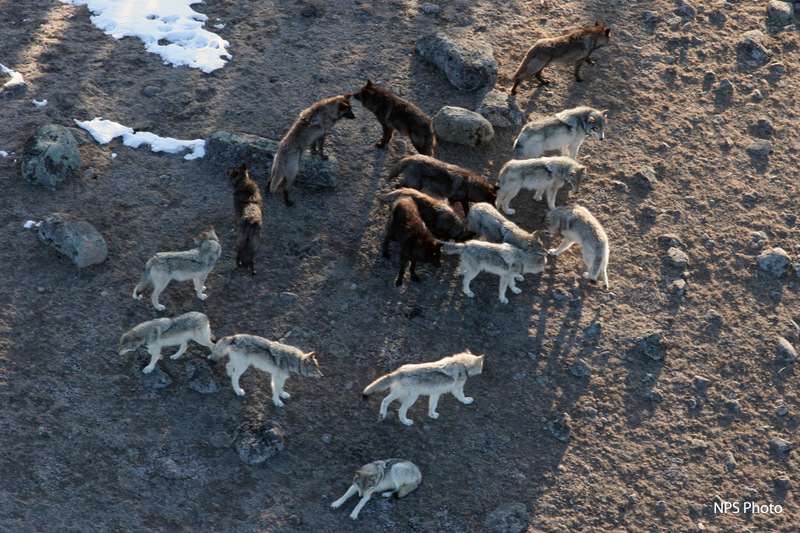 Subsequently, the pack split to form the Oxbow Creek pack and only 8 wolves remained. The pack’s numbers surged again in 2006 when 209F and 469F produced a total of 15 pups and in 2008 when 625F and 209F reared 25 pups. The pack began to deteriorate in late 2008, beginning with the alpha male (534M) being killed by other wolves. Other pack members were killed by other wolves, had failing radio-collars, or showed signs of emaciation and mange. Wolf 625F who was once a prolific breeder was the last remaining Leopold wolf until she was killed in 2009 as a control action in Montana; a necropsy determined that she was emaciated and infected with mange.